Polarizing nuclear spins is of fundamental importance in biology, chemistry and physics. Methods for hyperpolarizing 13C nuclei from free electrons in bulk usually demand operation at cryogenic temperatures. Room temperature approaches targeting diamonds with nitrogen-vacancy centres could alleviate this need; however, hitherto proposed strategies lack generality as they demand stringent conditions on the strength and/or alignment of the magnetic field. We report here an approach for achieving efficient electron-13C spin-alignment transfers, compatible with a broad range of magnetic field strengths and field orientations with respect to the diamond crystal. This versatility results from combining coherent microwave- and incoherent laser-induced transitions between selected energy states of the coupled electron–nuclear spin manifold. 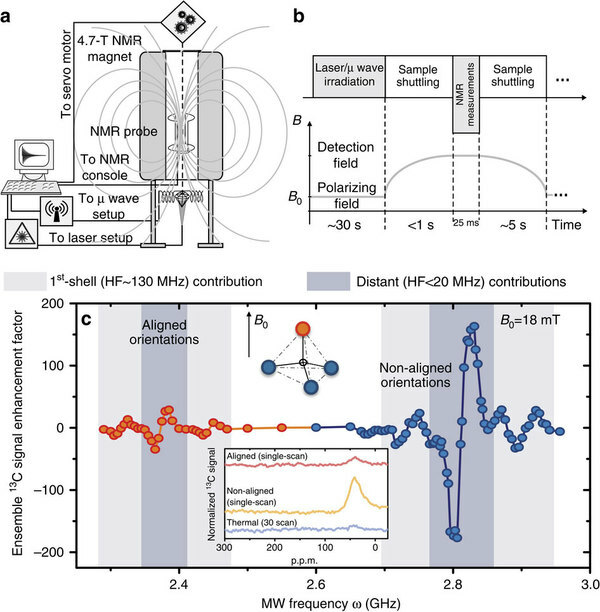 13C-detected nuclear magnetic resonance experiments demonstrate that this hyperpolarization can be transferred via first-shell or via distant 13Cs throughout the nuclear bulk ensemble. 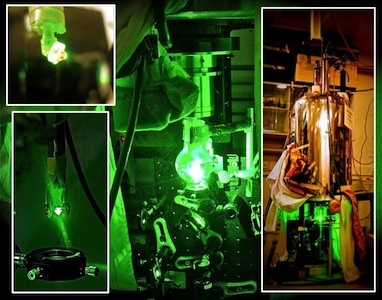 This method opens new perspectives for applications of diamond nitrogen-vacancy centres in nuclear magnetic resonance, and in quantum information processing. Acquiring ensemble 13C polarization spectra for varying NV orientations with respect to B0. (a) Opto-NMR set-up and (b) detection sequence used in these experiments. During the polarization transfer phase, the entire single-crystal diamond is irradiated with laser light and MW underneath the NMR magnet at a low B0. The hyperpolarized diamond is then shuttled (in <1 s) into a 4.7-T superconducting magnet to directly detect its macroscopic 13C magnetization via a spin-echo sequence. The low B0 magnetic field is aligned to one of the nitrogen-vacancy-centre orientations (in red), while the other three orientations (in blue) subtend an angle of ≈109° with respect to the field. (c) Typical 13C polarization enhancement patterns observed by NMR as a function of the MW frequency ω with signals normalized with respect to the thermal 13C response at 4.7 T (inset). The left part of the plot corresponds the nuclear polarization generated by MW transitions for the aligned orientation (red circles), while the right part corresponds to nuclear polarization enhanced via the three non-aligned, equivalent orientations (blue circles). The ≈1:3 intensity ratio reflects the relative abundances of aligned and non-aligned sites in the diamond’s tetrahedral structure. In each of the patterns, the central peaks represent bulk nuclear hyperpolarization pumped via 13C spins coupled with hyperfine interactions lower than 20 MHz, while the outer peaks originate from first-shell 13Cs whose hyperfine splitting is ≈130 MHz. The inset shows NMR spectra obtained for a thermally polarized sample, and at the maxima of the central peaks for the aligned and non-aligned orientations. p.p.m. refers to parts-per-million of the high-field NMR 13C resonance frequency, which in our case is 50.5 MHz. This entry was posted in Publications and tagged Applied physics, Condensed matter, Diamonds, DNP, Hyperpolarization, nuclear magnetic resonance, NV centers, Physical sciences.